Sailing yacht Helia 44 named HEL 44 CAR has been built in 2014. We offer this sailboat from marina Orhaniye in region close to Marmaris. HEL 44 CAR is registered for 10 crew members. Layout of the yacht is 10. Helia 44 HEL 44 CAR is equipped with 6 cabins. For guests disposal there are 4 toilettes. You can fill the fuel tank with 750.00 l liters and in water tank it goes even 450.00 l liters. With motor 2x55 hp Volvo HEL 44 CAR can sail really fast. HEL 44 CAR is 13.30 meters long and 7.40 meters wide. Draft is 1.15 m. Click for other vessels here: Catamarans Orhaniye. 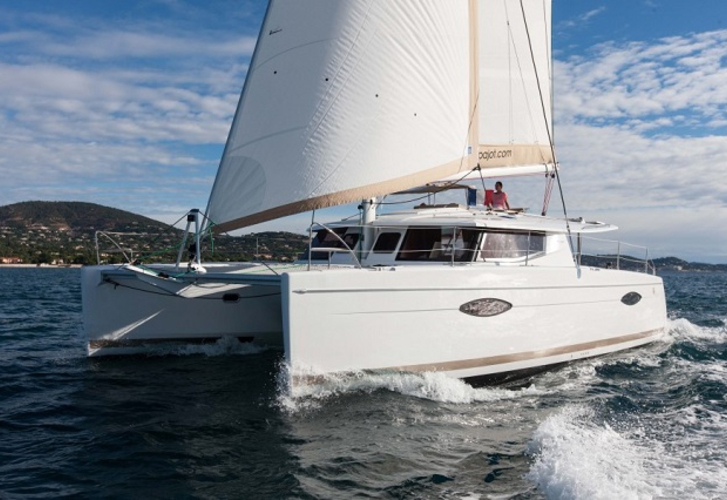 Vessel's equipment includes : Autopilot, Gps, Bimini top, Anchor electric windlass, Radio / cd player, Solar panels, Mainsail with lazy jack. . Nonrefundable caution is 3500.00 EUR. Choose our offer and have good time on the deck of HEL 44 CAR. This Helia 44 from Orhaniye from Turkey You can analyze in this site: Catamarans Turkey.